Upper Hemel-en-Aarde Valley property Restless River is getting all the right attention at the moment – 4½ Stars for both the Chardonnay 2012 and Cabernet Sauvignon 2011 in the current edition of Platter’s and a glowing review on Grape.co.za (see here). Are they destined for cult status? My feeling is that the Chardonnay still has some way to go while the Cab is definitely worth investigating. Fermented and matured for nine months in French oak, 33% new. Aromas of white flowers, lemon and orange, a subtle yeasty note. Sweet fruited with coated acidity and well judged oak. Very appealing but perhaps lacking the detail to warrant its price tag. A cult wine in the making? Spontaneously fermented and matured for 23 months in French oak, 33% new. Good spectrum of flavours including red through blue to black fruit, violets and an attractive herbal quality. Medium bodied and well proportioned – happily not too extracted. A gently savoury finish. A pretty wine which is not something you can often say about Cab. Previous articleMarthèlize Tredoux: Who drinks wine? How would you define “cult” status? Could be worth writing an article on your thoughts? In short, I think a wine becomes “cult” when it manages to capture the imagination of those highly involved with top-end wine without much track-record. Further, I think “cult” wines are typically produced in smalls volume – the rarity factor contributing to their desirability. 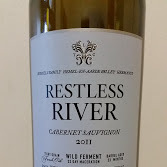 Restless River with 246.75 cases of its Chard and 211 cases of its Cab is certainly on track in this respect. Would Penfolds Grange be considered cult? Thats made in relatively substantial quantities by a corporate wine company. Grange is your quintessential icon.